-Registration for exhibitors starts 1 December 2018 and runs up to 31 May 2019. -An invoice will be sent via email by School of Arts Ghent. Payments are possible through wire transfer or credit card. -Payments are due two weeks after reception of the invoice. Unpaid invoices will immediately result in cancellation of the exhibit contract. Payments will not be accepted after June 15. –BEWARE: Exhibitor badges are valid only on exhibition days (3 to 6 July)! Participant badges for 1 and 2 July can be purchased upon simple request at 75€/person/day. The exhibits at IHS51 run Wednesday 3 to Saturday 6 July and will be held at the heart of the festival in the prestigious Sint-Baafshuis, opposite the conservatory. General exhibit space is available through the purchase of a 1.5 m2 tablespace. Typically, the exhibitions will be set up in large conference rooms. All rooms are fully accessible with elevators, have fast and reliable Wifi and power sockets (EU). You are responsible for bringing extension chords and necessary Euro-plug adaptors. The exhibition rooms are fully alarmed during the entire closing time of the exhibits. Standard table size is 200 x 75 cm. All exhibitor spaces will be sold/paid as multiples of this unit size. Please note any special requirements on the information form. First table gets 1 exhibitor badge. One badge per additional table will be added. The maximum number of badges per exhibitor is 3. A welcome reception & Walking Dinner for all exhibitors will be held at Wijnaert Exposition hall on Wednesday 3 July, 20:00-22:00. All exhibitors must purchase tables to sell or display items at the Symposium. Fees will not be reduced for an exhibitor who provides his/her own table(s), does not need table space, or does not participate for the duration of the symposium. Any additional space used by an exhibitor (e.g., displays, racks, tables brought by exhibitor), will be charged an additional fee and may not be permitted due to lack of space if not previously declared. We suggest to note these on the initial enquiry form. If you have any questions, please contact the exhibits coordinator. Each exhibitor receives one badge with the purchase of one table and one additional badge with the purchase of additional tables. Exhibitors must purchase additional badges for members of their company to participate in the symposium. A maximum of three total badges is permitted for each company, regardless of how many tables purchased. 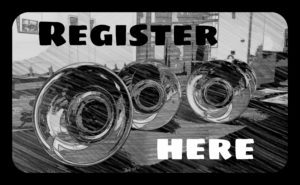 Each business must register individually to be represented at the horn symposium. If your business is selling items for another company that will have representatives of its own at the symposium, you are required to register each company as an exhibitor. Failure to do so will mean that the non-registered company will not receive recognition online, in the program book or during the symposium as being a participating exhibitor. Special request (f.e. rom for special exhibit tables, music stands, video equipment,… ) will be subject to a tailor-made offer. Price will then be based on the width of the display according to the unit sizes described above. EXHIBIT SPACE IS ASSIGNED BY THE EXHIBITS COORDINATOR BY DATE OF REGISTRATION. All table coverings and display items are to be provided by the exhibitor. Exhibits will set-up from 8 am on Wednesday, July 3rd and exhibitors are encouraged to give an approximate time of arrival so that staff will be able to assist in the unloading of items. Exhibit space will open at 1 pm that same day. There will be student volunteer workers to help assist the set-up. St-Baafshuis and Conservatory are easily accessible for loading/unloading with normal-size vehicles and mid-size vans (up to Mercedes Sprinter size). A plan for access will be provided some weeks before. All vehicles will need to be moved after unload. The closest parking lot is Reep (3 minutes walk) and applies a rate of +/- 27€/day (access is possible for cars and vans under 2 metres high). Considerably cheaper and even free parking is available within 15 minutes walking/public transport. The front of the exhibition venues are in a traffic-free zone and severe penalties apply for any unauthorized vehicle trespassing the electronic barriers or parking in resident’s bays. Please carefully read our access notes and consult our Travel and Lodging page. Exhibits close Saturday, July 6 at 20:00. Break down of exhibits can be up to 22:00 Saturday evening and should be done by 11:30 am and 8:30-11:30 am Sunday morning. Only items prepaid for shipping (UPS, DPD, DHL/Bpost) and with a pick-up time for Monday, July 8, 2019, will be permitted to remain at School of Arts Gent after the close of exhibits. A stock place will be assigned at the moment of tear-down by IHS51 staff. Neither the Exhibits Coordinator, School of Arts Gent, or IHS can make for or on behalf of any exhibitor any payments to carriers. If a carrier does not accept any box, the shipper will be notified and the box held for no more than one week. After that, it will be disposed of, with no recourse to the Exhibits Coordinator, the hosts or IHS. Any remaining items will be discarded. Exhibitors must pick up any leftover trash, packaging materials, or unwanted items and dispose of them properly. Please leave your space as you found it. Failure to do so will result in cleaning charges billed by the exhibits coordinator. Housing and Meals: Exhibitors are responsible for their own lodging and catering. Coffee/tea and water will be at the disposal for free for exhibitors. This general information and regulations for exhibitors become a part of the contract between the exhibitor and the 51st International Horn Symposium. They have been formulated for the best interest of the exhibitor. We respectfully request full cooperation of the exhibitor in their observance. All points not covered herein are subject to the decision of the Horn Symposium Host and the International Horn Society. For the safety of all exhibitors and their property at the symposium: rooms will only be opened at the assigned times. Neither the Exhibits Coordinator nor exhibitors will have access to rooms at any other time. Please plan carefully. No items shall be posted, tacked, nailed, screwed, or otherwise attached to any part of the walls, floor, or any other part of the building or furniture. This, or any other act, which interferes with the proper protection of these properties, shall be at the expense of the exhibitor. The 51th International Horn Symposium, IHS, School of Arts Ghent, or any staff members will not be responsible for the safety of the property of the exhibitor from theft, damage by fire, accident, or other causes, but will use reasonable care to protect the exhibitors from such loss and will secure the building during those periods when the exhibit areas are not open to the public. The exhibitor rooms at St-Baafshuis will be fully alarmed during all closing times. No responsibility is assumed for goods delivered to the exhibit area prior to the conference or materials in the exhibit area after the close of the exhibits. Exhibitors must provide their own insurance. Items arriving before the symposium will be securely stored in Ghent Conservatory. Items will need to be acquired promptly between 8 and 11 am on Wednesday 3 July, 2019, and moved to your vendor location. Items should arrive no earlier than Juny 25, 2018. This general information and regulations for exhibitors become a part of the contract between the exhibitor and the 51st International Horn Symposium. They have been formulated in the best interest of the exhibitor. We respectfully request full cooperation of exhibitors in their observance. All points not covered herein are subject to the decision of the Horn Symposium Host and the International Horn Society.